Driving through the Kalahari region was a very interesting experience, this route offers a big bio and landscape diversity as well as some interesting culture and historical heritage sites. On this road trip we had a great chance to explore most of the Arid parks with their unique environment and wild life and camped at some amazing places under incredible Northern Cape sky. 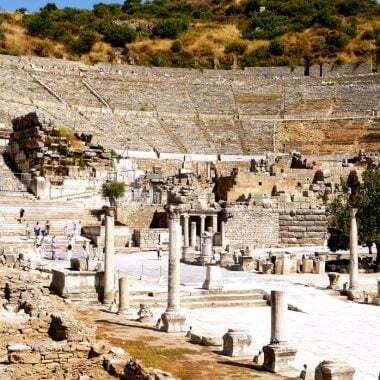 The whole trip took us 12 days if you have more or less time you can easily adjust it for your trip spending more time in some places or visiting less sites. 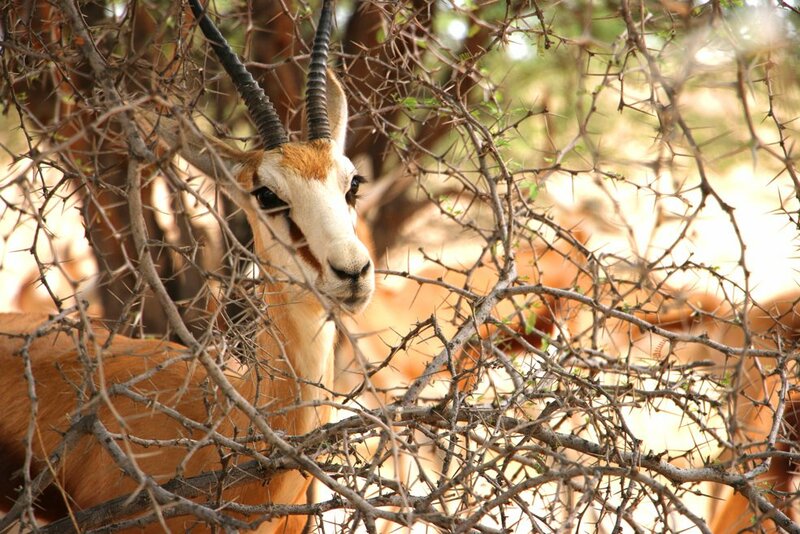 We hope you’ll find our itinerary helpful for planning a trip through the Kalahari. Cape Town Kgalagadi route; Cape Town – Ceres – Tankwa Karoo National park – Sutherland – Augrabies Falls National park – Upington – Meerkat Sanctuary – Twee Rivieren campsite (Kgalagadi Transfrontier park) – Nossob campsite (Kgalagadi park) – Mata Mata campsite (Kgalagadi park) – Upington – Witsand Nature reserve – Kimberley – Ritchie – Mokala National park – Hopetown – Orania town – Kambro campsite – Briston – Three Sisters (mountains) – Molteno pass – Beaufort West – Karoo National park – Cape Town. On this trip we visited and camped at 5 SANparks, all the campsites are fantastic; located in the nature, with amazing scenery, good facilities and well-priced (especially if you’re 6 people camping). The staff is always very friendly and professional ready to explain, to recommend and to help. We love SANparks and on our future trips going to explore all of them! SANparks website is have very good and helpful you can check availability and book campsite through it. Petrol (as usually on a road trip the main expense) – R4500. Accommodation (10 nights camping, 1 night hostel) – R3273. Your accommodation budget will be almost the same for up to 6 people because in most campsites you pay per site not per person. Entrance fees (for SA and residents, for foreigners multiply by 3) – R636 (if you don’t have Wild Card). Food (shopping, eating out, coffee) – R3400. Mostly buying food and cooking, a couple of breakfasts on the way and coffee stops. Total: R11 809 or R492 per person/day. If you’re planning to camp in SANparks or any other national parks keep in mind all the power outlets are opt for caravans if you don’t have one, you’ll need an adapter to be able to charge your devices. You can buy it in shops in most parks. On this route you drive a lot on gravel roads take a spare tire or two. Distances between towns in the Northern Cape are quite big always make sure you have enough petrol. The drive on the first day of our road trip wasn’t too long though the last 80km to the park office you drive on ok gravel road. On the way to Ceres you’ll drive through Michell’s pass, it’s very beautiful. Note! There is no shop or restaurant in the park bring food and water with you as well as fill your car with petrol (last petrol stop is in Ceres, 180km from Tankwa), in the park only diesel available. 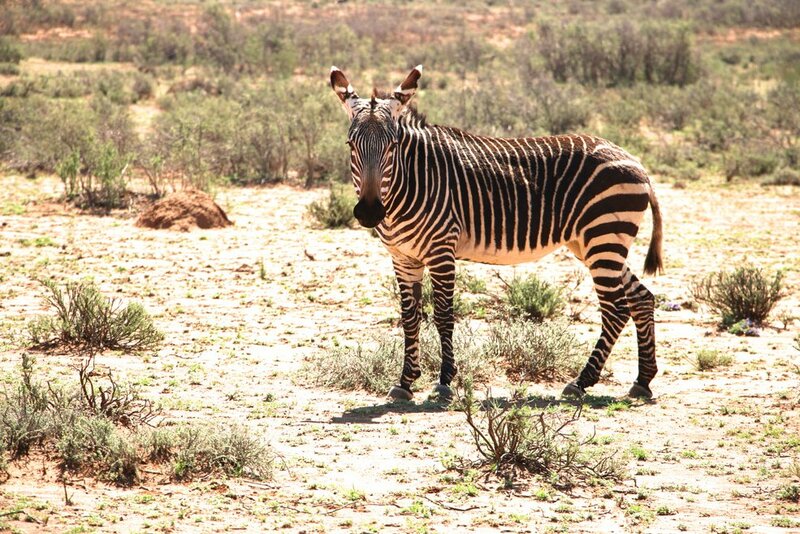 The park is located on the border between Western and Northern Cape in Succulent Karoo Biome, a unique entire arid spot. We stayed here only for one night but there are many different routes to drive and a lot to explore so it can be a nice weekend/holiday getaway place. In a clear night this place is an excellent star gazing spot. All roads in the park are gravel but if you don’t go to 4×4 trails you will be able to drive it with a sedan. Not to miss in the park the scenic drive through Gannaga Pass, the scenery and view from the viewpoint are breath-taking! Watch around for klipspringers jumping over the rocks you have a good chance to take some nice photos. Gannaga pass, Tankwa Karoo National park. What animals can you see in Tankwa? Aardvark, mountain zebra, gemsbok, springbok, bat-eared fox, black-backed jackal, klipspringer, bowsprit tortoise and cape cobra. Out of these we saw springboks, klipspringers, gemsboks and many birds. Camping – R318 per site, up to 6 people. Each site has its own toilet, shower and kitchenet. We really enjoyed camping here the area is beautiful it gives you a feeling of being in the wild far from bustling cities and noises hidden between the mountains but at the same time having all you need for a comfort stay. Don’t miss sunset at Perdekloof it’s magic! Other – kitchenette with a sink. Sutherland is a very nice little town with many guest houses and B&B and a couple of restaurants, SPAR and one petrol station (it’s closed on weekend from 13.00 Saturdays). We can recommend buying meat or biltong at a local butcher’s their chops and boerewors were very good. The Observatory is just 14km from the town. This place is definitely worth of visit if you do a tour you’ll learn a lot about the research work they do here, why Southerland is a good place for stargazing, what kind of telescopes are there. You visit SALT and can get an idea how it works and how many million light years far back scientists can see through it. Tour duration is between an hour and a half. In the reception building there are several rooms with info boards and artifacts that provide some interesting information about the space, galaxies and planets. There are two daily (no tours on Sundays) day tours at 10.30 and 14.30 since it’s not far to drive from Tankwa you can make it to visit the Observatory the same day. Tour costs R60 per person. Booking is essential it’s easy to do over the phone (023) 571-2436. We booked ours just an hour before. There are star gazing tours at night as well on Mon, Wed, Fri and Sat at 20.00 (in winter start at 18.00). Price R80 pp. During school holiday booked a tour beforehand to get a spot. We were unlucky in Southerland we couldn’t camp at none of the two campsites we had in mind, the first Verlatenkloof campsite (20km before the town) was closed due to some renovation work, the owner of the second, Sterland wasn’t there. We had to drive quite far out of the town, about 30km and camp at Skurweberg campsite. There are many B&B and guest houses in Sutherland we had breakfast at The Blue Moon guest house, it looked like a very nice place. By the way the owner of Sterland caravan park does a stargazing every night, contact Jurg Wagener for more info 023 571 1481. Skurweberg campsite. Price R100 per person. The other two campsites that were closed have similar facilities except Sterland has cell phone reception, prices are the same R100 pp. The whole day you basically drive through a lot of nothing so make sure fill your tank every time you see a petrol station. Next place after Sutherland with petrol is Middelpos, 50km away. You can buy food and supplies in Kakamas, 23km before the park. Augrabies Waterfall is a huge canyon made by the Orange river. It looks impressive even in dry season though there is not that much water. Best time to visit the falls in full flow is between February and April. There are wooden walking paths along the canyon you can observe it from different angles. Camping – R235 per site, up to 6 people. 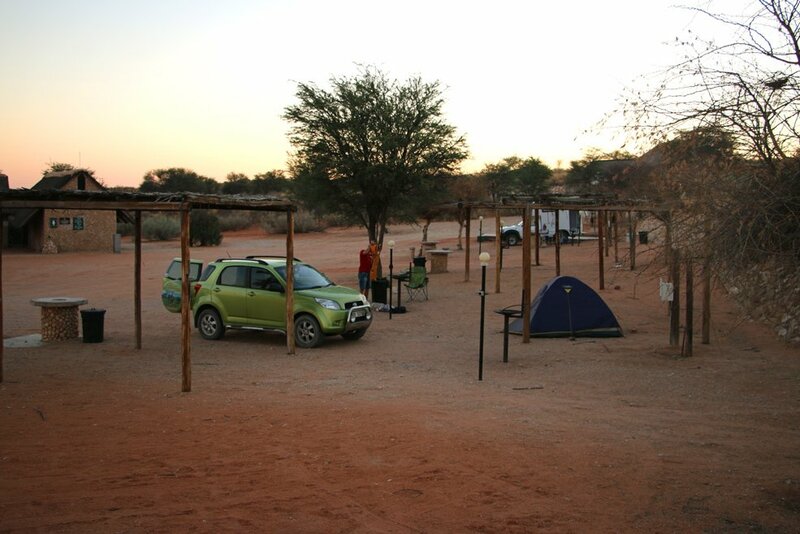 We really enjoyed camping at Augrabies, the parks stuff was amazing, they helped us to plan our visit to Kgalagadi Transfrontier park, phoned them and made a booking for us. There is a very nice restaurant at the reception building they have good coffee and Dassie breakfast for ZAR30 was a real bargain. In the local shop you can buy snacks, cool drinks, souvenirs and maps. Petrol is available at the gate. Other – kitchen with electric stoves, sinks, washing machines. Restaurant and shop at the reception. Hiking. There are two hiking routes; Klipspringer trail – 35km (3 days), opened from April to middle October. Dassie trail – 5km. Walking Dassie route we saw a couple of klipspringers, many dassies and some meerkats. 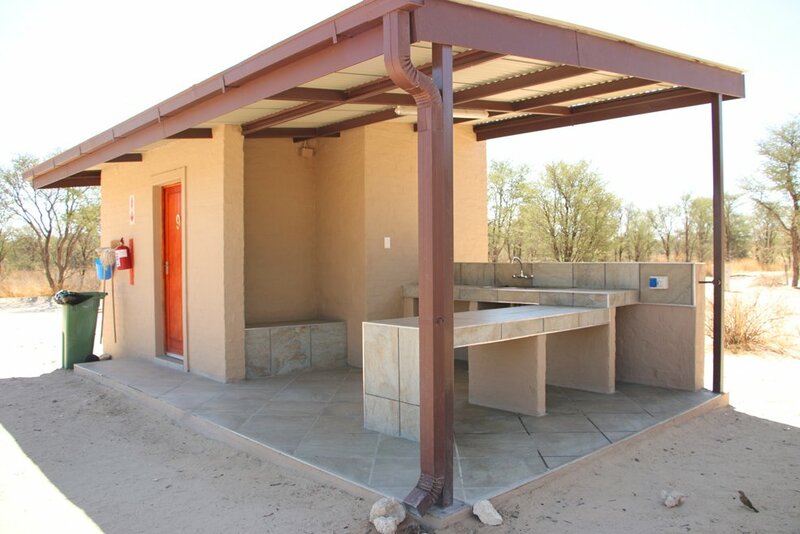 Augrabies – Upington – Meerkat Sanctuary – Kgalagadi Transfrontier park (Twee Rivieren campsite), 364km, 3h 40min. If you want to make it all the way to Kgalagadi park and stop for shopping in Upington, do some wine tasting and visit meerkat sanctuary you’ll have to start driving early. The drive is quite nice through some rocky hills and vineyards. There is a big mall in Upington where you can stock for the next days in the park. For wine tasting the best option is to go to Orange River cellar tasting room in Upington, they have some nice wines, tasting R20 pp. 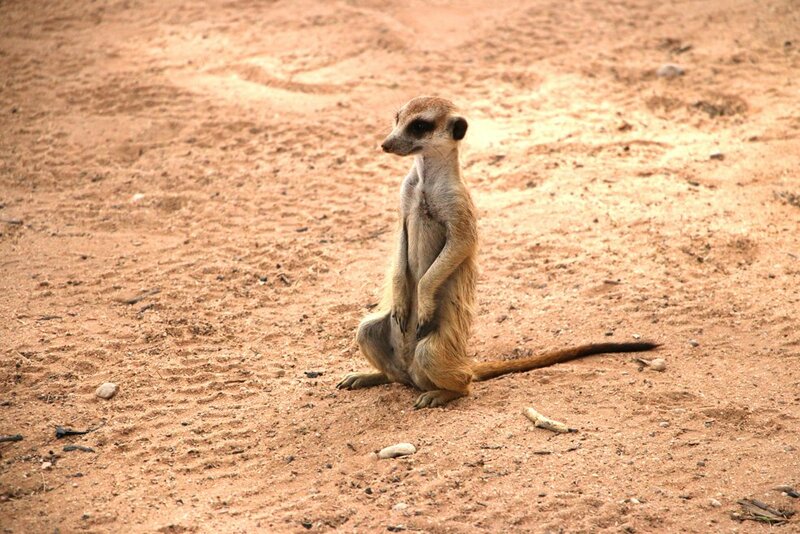 As you know the Kalahari is meerkat country, here you have the best chance to observe these amazing animals. 30km before the park there is a sign “Meerkat Sanctuary”, it’s basically a house where Professor Anne Rasa, a specialist in desert animals’ behavior, helps to rehabilitate meerkats that were rescued or confiscated from people. It’s an official Cape Nature rescue center. Usually there are many meerkats running around the house and a couple of babies inside. We were fascinated by these cute little animals with so much personality. If you travel with children, they will love this place it’s one of the few places where you can actually interact with meerkats without doing them any harm. The place works for donations. 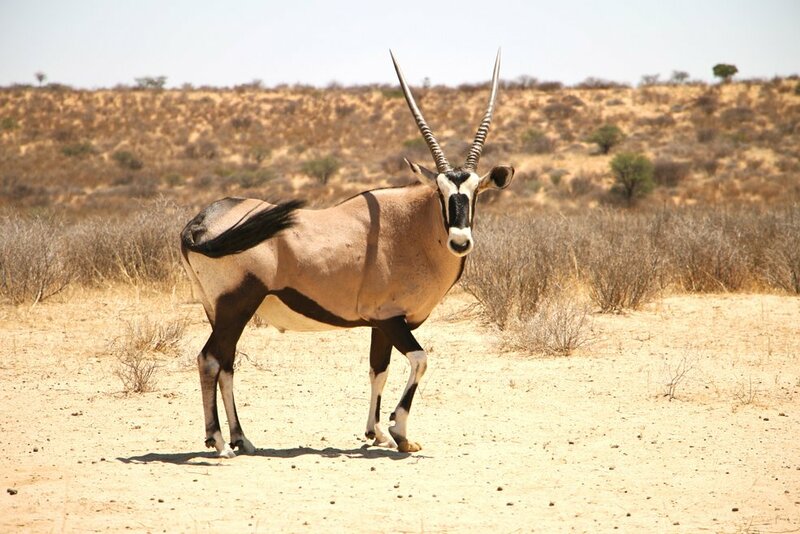 The wildest out of all SAN parks Kgalagadi is by far one of the favourite parks among South African safari junkies and wild life experts. We met many people in the park that’ve been here more than 10-15 times, they come almost every year and stay in the park for weeks. We’re quite far from being safari experts but definitely will come back one day and stay longer to explore every corner of this wild life paradise. Need to know! Twee Rivieren, Nossob and Mata Mata campsites have petrol but it it gets too hot in the afternoon petrol pump doesn’t work it’s better to fill your car early morning or late evening. We arrived at Twee Rivieren at 3pm and decided to go for a quick drive just 35km to and back towards Nossob it took us 3,5 hours and we saw; jackals, a Cape fox, many meerkats and ground squirrels, many gemsboks and springboks, some wildebeests, many ostriches. Remember! you must return to your campsite before they close the gate. The place has everything you may need for camping and safari. no worries if you forget to buy wood, fill your petrol tank or bring to deflate/inflate your car tires. Well-maintained campsite with good ablutions close to the main gate so even if you arrive a bit late it’s not far to drive. Phone for booking 054 561 2000. Site with electricity – ZAR330, up to 6 people. Site without electricity – R285, up to 6 people. Other – petrol station, swimming pool, shop, ATM in the shop (cash ). We started the drive quite early before 7am hoping to spot more animals and we did see some right in the beginning. 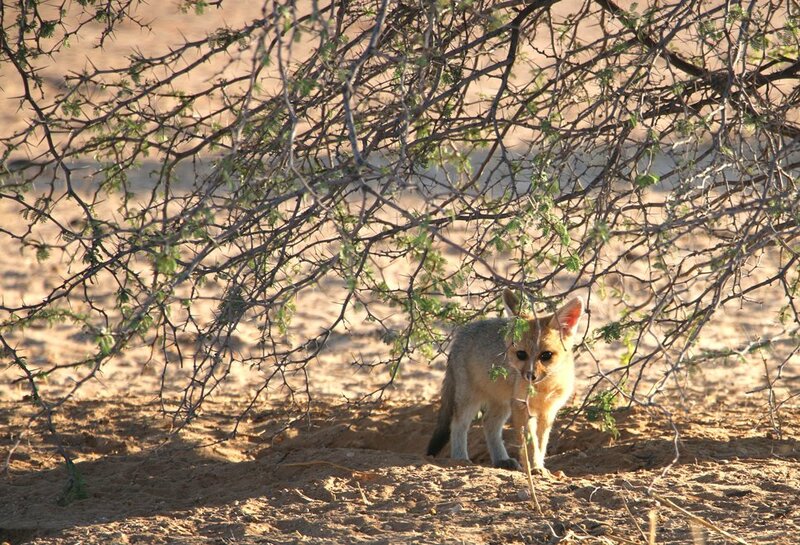 Cape foxes and jackals were very active in the morning digging and running around so we got some nice photos. Most of the springboks, gemsboks and wildebeests were still half-asleep. After that for most of the way we didn’t see much some occasional ostriches, jackals and bokkies. The road is half gravel half sandy not difficult to drive don’t need 4×4. There are two designated picnic spots between Twee Rivieren and Nossob with flushing toilets and running water. These are only places you allowed to get off the car. Standard campsites were fully booked so we had to book a premium one. When we got there, we were glad that had booked it we could sit outside under the roof drink coffee do some work and sort out photos. At night we heard hyenas and jackals, a couple of jackals somehow sneaked into the campsite and were running in search of food without worrying about people at all so don’t leave any food outside. Premium campsite (private ablutions) – R600 per site, up to 6 people. 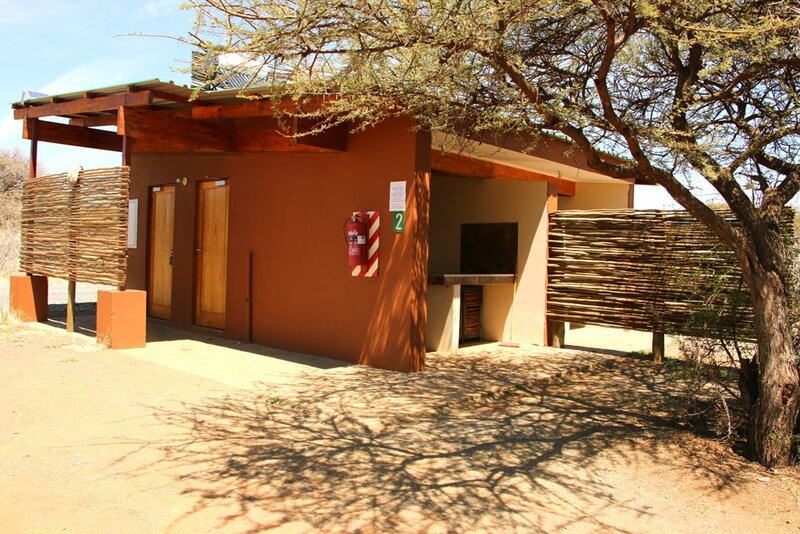 Standard campsite (shared ablutions) – R330 per site, up to 6 people. Other – petrol station, small shop, swimming pool. It was our worst day in the park we literally saw nothing till the last turn to Mata Mata, there we saw some springboks, gemsboks, jackals and many different birds. 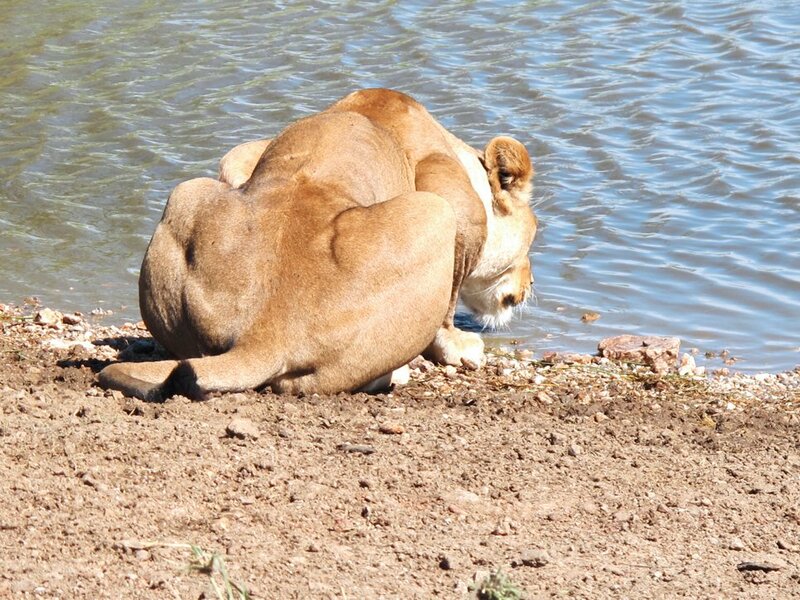 We did spend some time at two waterholes on the way but there were no animals there. The campsite was quite entertaining with many ground squirrel and meerkats running around and digging trying to find some food. Some people saw a cheetah at sunset and a hyena at sunrise at the waterhole. ZAR305 per site, up to 6 people. Other – petrol station, small shop, swimming pool, kitchenet, waterhole. By 6.00 when they opened the gate we were all packed and ready, we stormed after other cars trying to catch some nocturnal animals returning from their night hunt. First 100km through the park we drove very slow and stopped for animals a lot. It was our best day from the beginning just after we left the campsite we saw a wild cat, 5 minutes later two hyenas. Finally, we had some luck! This day we saw four lions (two male and two females), two bat-eared foxes, a Cape fox with two cubs. 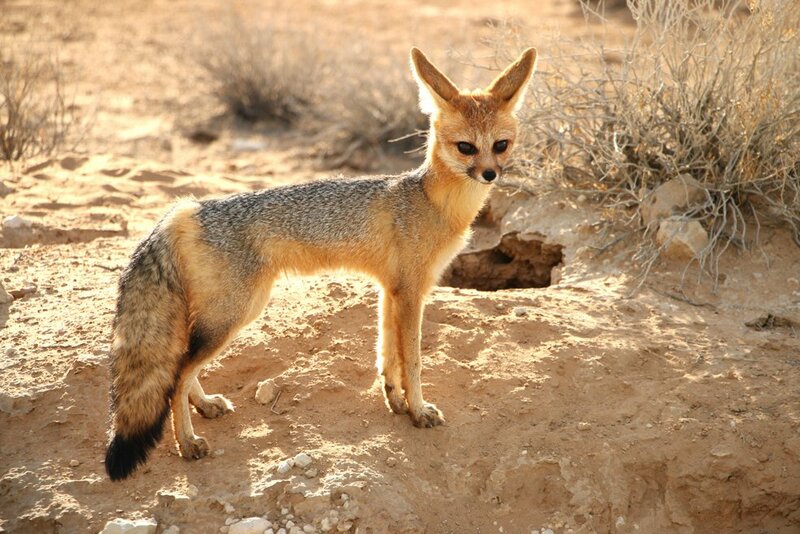 Not mentioning black-back jackals, boks, wildebeest, eagles, falcons, many meerkats and ground squirrels. Looks like driving between Twee Rivieren and Mata Mata you have the best chance for spotting predators especially lions everybody we met in the park saw a least a couple of lion on this route. From our experience this part was definitely the best part of Kgalagadi. We’d suggest to camp for a couple of days at Mata Mata and do morning and evening drives from there. Once at Twee Rivieren don’t forget to fill you tank, the next petrol station is 60km away at Molopo Kalahari lodge. We were quite tired of sitting in the car and decided to stop for coffee at Kgalagadi lodge which is only 5km away from the gate. If you don’t feel like driving further to Upington you can camp here they have great facilities, nice restaurant and swimming pool. Camping with private ablutions costs R350 per site for 2 adults and 2 children. Other – swimming pool, nice restaurant with good coffee, shop. After the coffee stop we kept driving to Upington as we had some friends there to meet up with. View over Kgalagadi Transfrontier park from a viewpoint. There are many guest houses and B&Bs in the town we stayed at Upington backpackers. It’s a good option if you want to say on a budget and don’t feel like camping. The hostel is nice, safe, close to the mall, has good wi-fi and all the normal hostel facilities; fully equipped kitchen, outside braai area, lounge room. The owners are super helpful and chilled they’ll make you feel here like at home. They started the hostel very recently and still working hard on improving it. Laundry service is available. Price R150 per person. 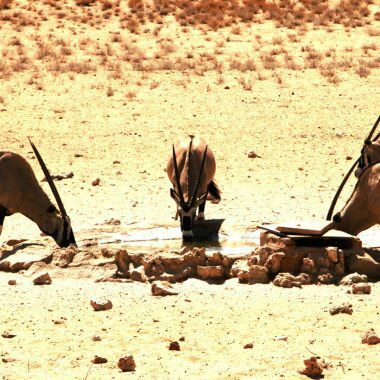 Upington – Witsand Nature Reserve, 150km, 2h20min. The park is famous for its white sand dunes that contrast against the red sand of the surrounding area. The dunes are between 20m and 60m high in a way they remind famous Namibian sand dunes just on a smaller scale. If you’re lucky and the weather conditions are right you can witness famous Roaring Sands of Kalahari. Springboks, steenboks, gemsboks, red hartebeest, ground squirrel, meerkat, porcupine, aardvark, bat eared fox, cape fox, genet, spring hare, aardwolf and many different birds. Adults – R60 Wild card is not valid here. Camping – R110 per person. If you stay overnight you don’t pay entrance fee. We didn’t expect much but absolutely loved camping here, the campsite is very spacious, with good ablutions, quiet and peaceful. Springboks and steenboks walking around the campsite not bothered by people presence. A couple of steenboks were walking around our site all evening and later at night we heard them eating coals from our fire. We saw a genet a couple of times next to our tent in search of food, it was the first time we saw that nocturne animal. It’s a great place to escape from the bustling city life the only noises you hear are those produced by animals. This campsite was one of our favorite on this trip. Tip! Bring mosquito repellent there were quite a few of them after sunset. Phone for booking 083 234 7573. Power outlets – yes, caravan type. Other – swimming pool, small shop at the reception. Witsand Nature Reserve – Kimberley (the Big Hole) – Ritchie (Riverside country club camping), 208km, 3h20min. Don’t forget to fill petrol at Griquatown it’s the only petrol station on the way before Kimberley. We almost ran out of petrol and just made it to Engen with 2l left. Kimberley is a capital city of Northern Cape so if you need to do some shopping or stock with food for the next days it’s a good place for these. It is an ex diamond mine turned into a museum. The hole is 240m deep and 463m wide and claimed to be the largest excavated by hand hole in the world. Digging started in 1872 and by 1914 over 22 million tons of earth was excavated and 3000kg of diamonds were found. The hole looks very impressive its turquoise blue water lake. On the museum territory there are some old style houses and running old trams you can walk around the streets, have a lunch in a restaurant or take a tram tide. An hour tour – R100. We wanted to camp at Mokala National park, but the campsite was fully booked for the weekend. Riverside Country club was the nearest campsite to the park campsite. We liked the campsite it’s spacious and grassy on the river bank. Good place to enjoy sunsets and sunrises. Standard campsite – R230 per site. Next to the river – R270. Other – small shop at the reception, kitchenette, swimming pool, dog-friendly. Ritchie (Riverside campsite) – Mokala National park – the Wagon bridge (Hopetown) – Orania town – Kambro campsite, 280km, 4h30min. The youngest of all SAN parks it’s predators-free park so if you want to see lions, cheetahs or hyenas it’s not the right place. The park is not very big if you’re driving from Kimberley the best way to see it is to enter at Lilydale gate and exit at Mosu Gate. Driving thorough we saw many springboks, zebras, wildebeests, gemsboks, ostriches, buffaloes, antelopes and some birds. If you like birdwatching don’t miss the Bird hide with a big water hole. There is a restaurant at the reception where you can pre-order lunch. Camping – R430 per site, up to 6 people. Other –kitchen with fridge and gas stove. Wagon bridge at Hopetown an interesting and quite off the beaten track attraction. A steel bridge over the Orange river, 8km outside Hopetown, that was built in 1871. You can drive across it and take some photos it’s quite long and high. A very conservative Afrikaans town with a couple of cozy coffee shops though quite small and a bit out of the way if driving from Kimberley towards Briston. We couldn’t really see much as in was Sunday afternoon and everything (including campsite) in the town was closed. So, we just drove around a bit it didn’t take that much time the town is really small. This day we didn’t feel like driving too far further and camped at Kambro Accommodation, 20km before Bristown. The campsite is in the middle of nowhere surrounded by vast plains with some mountains on the background. Good place to watch sunset. Price R200 per site, up to 6 people. 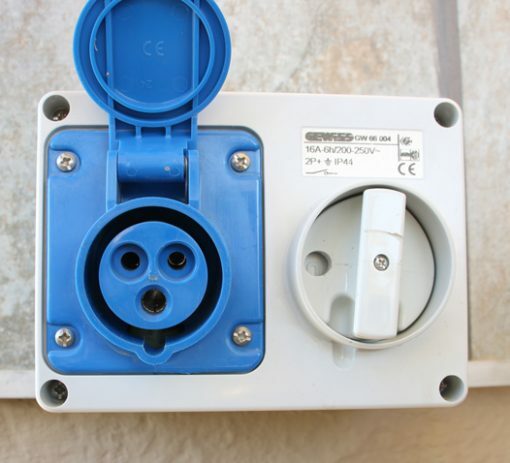 Power outlets – yes, caravan type. The standard one you can find in the toilets. Other – grassy spots with bamboo fencing. Shop and restaurant at the reception. Kambro campsite – Briston – Three Sisters (mountains) – Molteno pass – Beaufort West – Karoo National park, 320km, 3h30min. Three Sister are in fact three similar shaped mountains next to each other. You can see them from the road but the best view you get if you turn off from the road towards Three Sister guest farm. Just before Beaufort West take a right turn this road goes through beautiful Molteno pass it’s not far to drive will take extra 20min. to and back. Beaufort West is quite a big town good place to do shopping and fill the petrol. Karoo National park surprised us with its stunning landscape and biodiversity; mountains and passes with breath-taking view points and many wild animals around. There are even lions here we didn’t expect it unfortunately we didn’t see them. But we saw many mountain zebras, gemsboks, springboks, elands and red hartebeests. There are several loops that you can drive some only 4×4. Not to miss Klipspringer pass and view point. Camping – R295 per site, up to 6 people. Power outlets – yes, caravan type. You can buy an adaptor at the shop for R175. Other – kitchen with a microwave and electric kettle, laundry room with washing machines. Swimming pool, shop and restaurant at the reception. Fossil trail, 400m trail that will take you through an impressive collection of prehistoric fossils found in the area. Karoo National park – Cape Town, 557km, 5h20min. Basically, just driving back to Cape Town in N1 watch for trucks and drive safe. Wild card breakdown. How much money we saved with our Wild card (couple)? We bought our Wild Card All parks (couple) just before the trip for R845, now it costs R930. You can buy it almost at any SANpark office, you’ll need your ID or passport to prove your citizenship/residency. Let’s see how much money on entrance fees we saved with our Wild Card on this trip. We paid R845 for our Wild card and on this trip already saved R516 and we still have 11 months ahead to use it. If you’re not a frequent visitor to SAN and other national parks and go no more than 4 times a year than it’s not worth to buy it. If you’re a foreigner and don’t have South African residency (temporary or permanent) it’s not worth to buy it the same Wild card (couple) will cost you R3800. If you’re South African and go to SAN and other National parks quite often then Wild card is a really good deal for you. Hello,I am planning a similar trip from Cape Town in July,except I intend to head into Botswana and CKGR.A few websites mention that two vehicles are required for Kgalagadi,do you know how strict they are with this policy. Very helpful website by the way. Hello, Mick! Thank you for the comment! As far as we know it’s required to be in two vehicles if you want to visit Botswana part of the park, passport control is at the park office I guess they will be able to see that there is only one vehicle. We haven’t tried to go to that part of the park. Loved getting the info from your site, I was looking for info on Kgalagati park, your site had the most valuable info I found online as i searched Guide to Kgalagati, Info from the other sites seem vague You nailed it !
. Were hoping to go for a week Sept 23 -29 but cant find campsites to stay at as they all seem booked. Not sure I buy into that as we have been to Kruger and some of the other SA parks camps, they show sold out when there is availability. Your tip on the road from Twee Riviera to Mata Mata sure made me think that is what I want as you mentioned its the most popular area for cats. Which is why I want to go to photograph there as the light and open backgrounds make for very special pics. We are a couple from Canada, this years trip will be our 6th time, we love SA ! Were 50’s /60’s and love to travel, envy your lifestyle of continuous travel. We rent a house in Marloth Park SA each year usually for 3 months ( max time allowed by foreigners) If your up that way your welcome to stay with us for free, we always have a 2nd bedroom open. Animals roam freely in Marloth park, but no dangerous ones, 15 minutes to the Crocodile gate to Kruger, your allowed to feed them hay and special game pellets, they come when you put the food out, its quite entertaining and we have gotten hooked on being close to them and getting used to regular visitors. Have you ever been? Hi, guys! Thank you very much for reading our blog! We’re glad you’ve found it helpful! It’s possible that campsites in Kgalagadi are not available for booking so long beforehand otherwise it’s very strange everything is fully booked. South Africa school holiday starts only on 28th September (till 9th October) that time is usually very busy but not just before it. We’ll phone tomorrow to Kgalagadi park and find out about campsites for your dates and will let you know. If it’s fully booked staying outside is an option, that lodge you’re talking about (I think it’s Kgalagadi lodge) is very close to Twee Rivieren Gate we stopped there on the way back for coffee, a very nice place. That day we drove from Mata Mata to Twee Rivieren and back to Springbok, it’s definitely possible to do day game drives from the lodge. Thank you for the invitation! We haven’t been to Marloth park, the place sounds amazing! Keep in touch! Guy and Victoria, we phoned today to Kgalagadi park and they told us there are many opened camping spots at Mata Mata and Twee Rivieren between 23rd and 29th September. Try again to book online. Hopefully everything will work out! Good luck!